Alcatel brought the big guns at the MWC expo with the introduction of the One Touch Idol X, and we mean that literally. The phone has a 5" Full HD display that is oh so trendy , but the rest of the specs are no slouch either. The unit we handled was definitely pre-production softwarewise (Android 4.2 with light skin) and most likely in hardware too, so things might change for the retail version. The Idol X feels very thin and light, despite the huge display, and is fairly compact for the panel thanks to the thin side bezel. There is a nice soft-touch texture on the back, which is not fond of fingerprints, but comes in a variety of jolly colors, giving the phone some cool teen spirit. The 1920x1080 pixels screen is, of course, with excellent pixel density, and everything appears as sharp as your eye can comprehend. Viewing angles are also very good, and we'd only like it to be a tad brighter. Under the hood, the Alcatel One Touch Idol X is powered by a 1.2GHz quad-core processor, sporting 16GB of internal storage and a 2,000mAh battery. The camera is a 13 MP or 8 MP, depending on the region, with 2 MP on the front, and everything is packed in a 7.1mm thin body, so kudos to Alcatel for wrapping it up so tight. Moreover, the single-SIM variation is also having a microSD slot for storage expansion, while the dual-SIM one won't have a memory card slot. 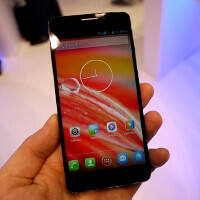 Have a look at out hands-on pictures and video of the Alcatel One Touch Idol X below. That is seriously one of the nicest looking phones. Hopefully the GS4 looks similar but is even smaller.